Henry Sun is the second of five children and the oldest surviving child of his nuclear family. Born in Boston, MA and raised in Rochester, NY, he graduated from McQuaid Jesuit High School in 1977; from Wheaton College in 1981 (BA in Bible, Religion, and Theology) and Wheaton College Graduate School in 1983 (MA in Theology); and from the Claremont Graduate School in 1990 with a Ph.D. in Religion with a concentration in Old Testament Theology. 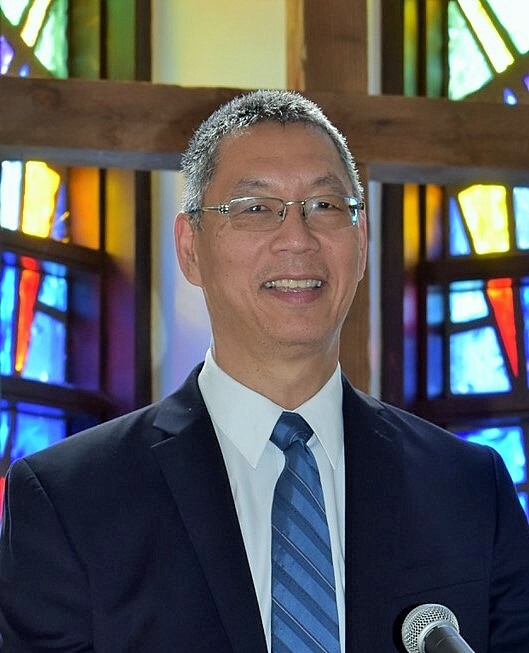 He was ordained as a Minister of Word and Sacrament in the Riverside Presbytery in 1987 and has taught at Lexington Theological Seminary (1990-1992). He served the Montebello Presbyterian Church as its Stated Supply Pastor in 1996-1997 and the Fairfield Presbyterian Church as its Temporary Pastor in 2017-2018. In 1997, Henry moved to Northern California where he spent 10 years working in the mortgage business. When that industry collapsed in 2007, he switched careers and became a public high school math teacher in the Vallejo City USD, which has been his primary vocation since 2008. Henry’s family includes his fiance (Stacey Marvin); their two Giant Schnauzers (Thea and Reina); and from time to time a college-graduate son currently training with the Marine Corps (Tyler). When Henry is not teaching math or writing sermons, he enjoys reading; solving crossword puzzles; playing scrabble; and watching superhero movies and TV shows. When he is sufficiently motivated, he goes to the gym, on a seemingly futile quest to lost those last 10 pounds. He is an enthusiastic, casual guitar player and writes columns on Religion and Spirituality for the Benicia Herald and the Daily Republic (Fairfield) newspapers. I wish that I could somehow adequately express to you the overwhelming sense of blessedness I feel at this opportunity to serve you as your pastor. I’m truly humbled by this invitation, excited for what our journey together might hold, and I’m anxious to get to know you in the coming weeks and months. My highest and most fundamental theological priority is the “all-ness” of God. Not with respect to the God who knows all, sees all, and rules over all. Theologians call these the “omni-attributes” of God: God’s omniscience (knows all), omnipresence (is everywhere at the same time), and omnipotence (rules over all). No, my understanding of the “all-ness” of God has to do with God’s relationship with creation: how all of creation was created by God and declared good, how all of humanity is created in God’s image, how God so loved all the world, how Jesus died to redeem all of us from all our sins. It has to do with the universality of God’s love, God’s grace, and God’s mercy, a universality that I pray will be our defining characteristic in Benicia and beyond as we welcome, embrace, and integrate everyone who was created by God and who is loved by God that comes to worship with us. And by my lights, that would seem to be everyone, even and especially those that might not look like us, might not dress like us, and might not think like us. I thank you again and can’t thank you enough for this opportunity to serve you. I covet your prayers, your insights, and your input and feedback as we walk this journey together. May the love of God, and the grace of our Risen Savior, and the fellowship of the Holy Spirit be always with us all.